Here at ThreadABead we love using graphical patterns for our designs and we rarely use word charts. There are several reasons for this: 1. Word charts are time consuming for us to check, and we like to keep our patterns as error free and as low priced as possible. 2. We love freeform designs, that is designs that have irregular edges. This makes word charts much more complicated to follow as we tend to begin the pattern in the middle and work outwards. 3. If you know how to read a pattern, there is really no need for a word chart. Additionally, by following a picture you can see if you have picked up the wrong bead a lot quicker. On www.ThreadABead.com we have many 2D patterns using freeform edges. You can choose to use either using Brick Stitch or Peyote as the same pattern can be used for both stitches, they are just followed in different ways. Although Peyote stitch is the more popular stitch and can technically be used it is much more complicated on a freeform design, so we always recommend they be attempted in Brick stitch as it is a more versatile stitch for irregular shapes. It has come to our attention that there are some of you who are yet to learn the skill of following a graphical pattern using Brick Stitch, and so are restricted heavily on what you can and can't bead from our site. This just will not do! 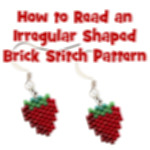 We have asked our designer, Lynsey James to write a guide on how to follow a graphical bead pattern using Brick Stitch. You will see it is actually a very easy and useful skill to master and during the process you will create a beautiful pair of strawberry earrings. We have aimed this document at beginners to beading and no prior knowledge of Brick Stitch is required.